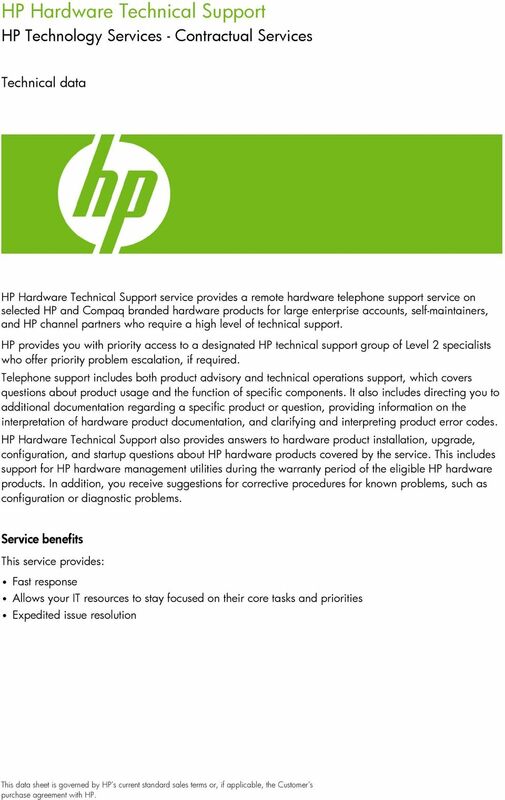 Download "HP Hardware Technical Support"
1 HP Hardware Technical Support HP Technology Services - Contractual Services Technical data HP Hardware Technical Support service provides a remote hardware telephone support service on selected HP and Compaq branded hardware products for large enterprise accounts, self-maintainers, and HP channel partners who require a high level of technical support. HP provides you with priority access to a designated HP technical support group of Level 2 specialists who offer priority problem escalation, if required. Telephone support includes both product advisory and technical operations support, which covers questions about product usage and the function of specific components. 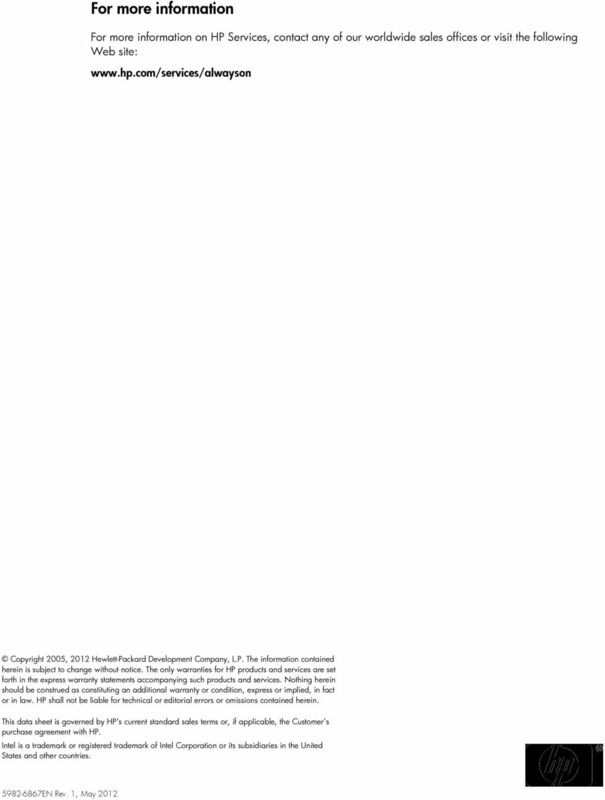 It also includes directing you to additional documentation regarding a specific product or question, providing information on the interpretation of hardware product documentation, and clarifying and interpreting product error codes. 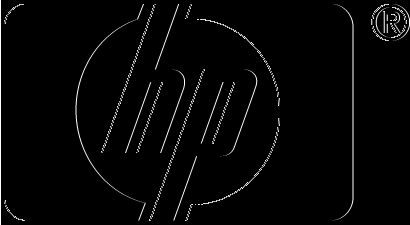 HP Hardware Technical Support also provides answers to hardware product installation, upgrade, configuration, and startup questions about HP hardware products covered by the service. 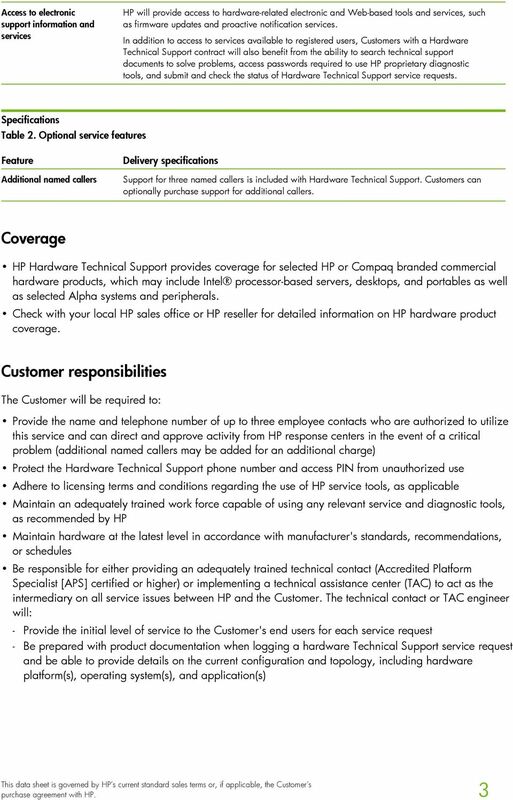 This includes support for HP hardware management utilities during the warranty period of the eligible HP hardware products. In addition, you receive suggestions for corrective procedures for known problems, such as configuration or diagnostic problems. Service benefits This service provides: Fast response Allows your IT resources to stay focused on their core tasks and priorities Expedited issue resolution purchase agreement with HP. HP Hardware Support Onsite 6-Hour Call-to-Repair Service - U.S.
HP Hardware Support Onsite Service - U.S.
HP Support Plus Service HP Care Pack Services HP Support Plus Service is composed of comprehensive hardware and software services that enable you to increase the availability of your IT infrastructure. 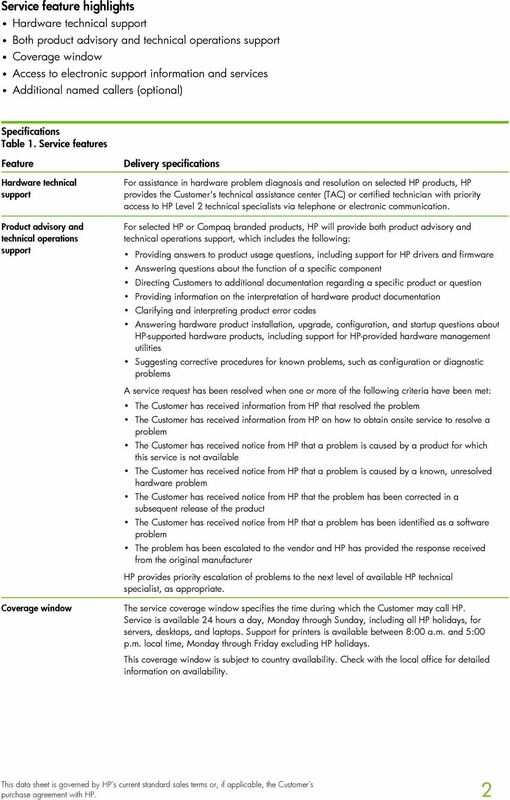 Data sheet HPE Foundation Care Service Support Services HPE Foundation Care Service is composed of comprehensive hardware and software services aimed to help increase the availability of your IT infrastructure. 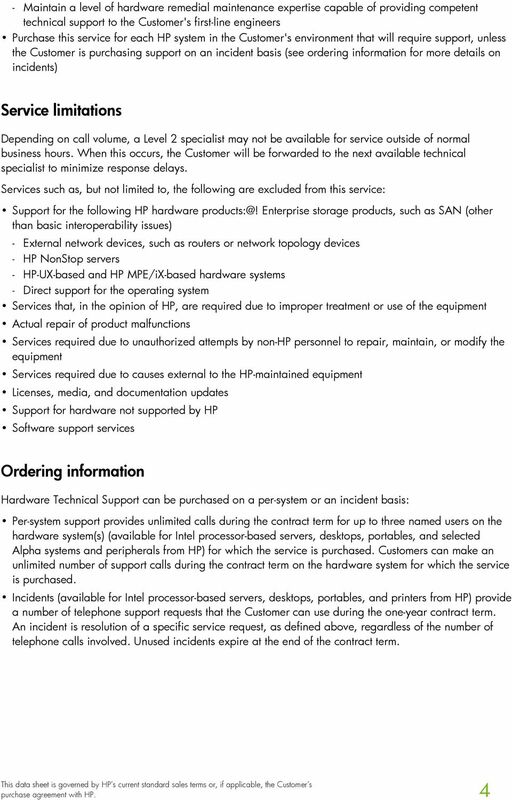 What is the HP Business Helpdesk number to call for support? Call 1-877-219-5006 to get support or for questions about the program. For your network: HP Network Support Combined with Cisco Services The primary goal of this service is to maintain reliable network performance and availability, and thereby protect your network investment. HP Windows Server 2008R2 OEM licenses are available for purchase from HP or your local authorized reseller.